Jake Bowers shows off his 5-star digs while parked on one of the most exclusive streets in Jackson Hole. Sam Morse photo. 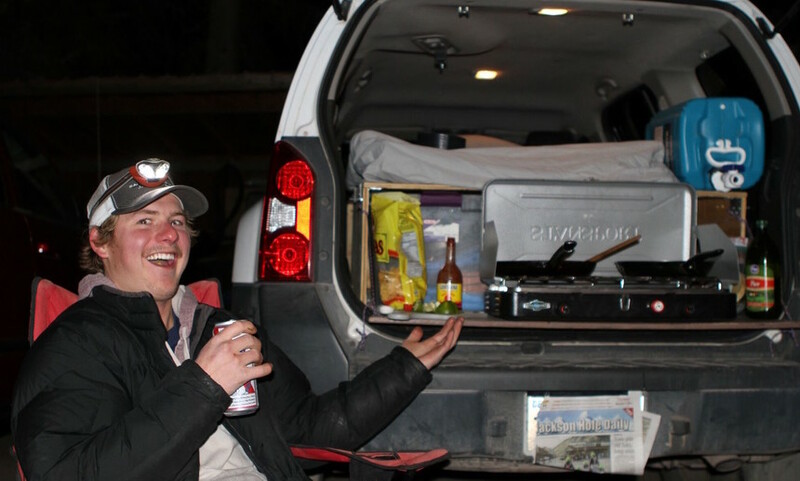 SKI TOWN, USA — The gods of ski town romance were tempted Thursday when a car camper hosted a fancy, romantic dinner (tacos and PBR) for a burgeoning love interest. Already 10 beers deep by the time of Mitchell’s arrival, Bowers allegedly tried his best to woo the young ski town seductress, offering up games of cribbage, thumb wars and the time-tested "platonic" back massage, all of which failed to override the young woman’s belief that Bowers simply wasn’t the dirtbag for her. The ski bum’s noble, but futile, attempts at seduction were ultimately thwarted when an anonymous homeowner called law enforcement to rein-in and put a stop to the street-level courtship. Nothing is more romantic than tacos, PBR and the smell of exhaust. Shortly after the humiliating run-in with law enforcement, the thwarted would-be lovers parted ways, with Bowers retreating into the snugly confines of his Xterra to lay awake for seven hours vetting Tinder and Bumble matches. I loved his lifestyle man. Really impressive lifestyle. Panda Helper VIP Free is another level free app to install premium apps. Isn’t it sounds good ? ?.